Wisconsin Pet Care — Wisconsin’s highest-awarded and rated dog walking and pet sitting company serving Oak Creek, 53154 would LOVE to care for your fur kids. 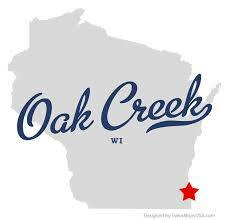 Located in Milwaukee County, Oak Creek is a bedroom community to Milwaukee and has a thriving, growing and bustling economy with some serious expansion happening. It’s a great place to settle down, raise a family (including dogs and cats!) and have everything that you need close by. Our Oak Creek Dog Walkers and Pet Sitters will come and visit your home while you are away at the office or while you are enjoying a much needed vacation. Why choose Wisconsin Pet Care? Our pet sitters are bonded, insured, pet first aid and CPR certified, and have been thoroughly background checked. Their love of animals is second to none. The weather is inclement! What do you do – do you take my dog for a walk? He won’t go out – he hates the cold! Not to worry, we will take him out to do his business, come inside and do some snuggling, work on mental training such as commands, tricks and even puzzles! Did you know that a mental workout is as good as a long dog walk? Ready to Book Dog Walking and Pet Sitting in Oak Creek?